← Most Popular Author on Campus: George W. Bush?? If anyone is wondering just where Egypt is heading, here is a visual view of this society’s backpedaling, full tilt into the mud and mire of the Middle Ages. 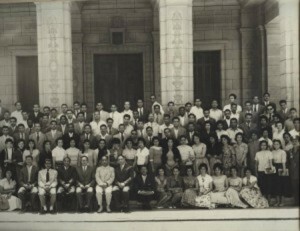 Take a look at the photographs of the graduating classes of Cairo University from 1959 to 2004. 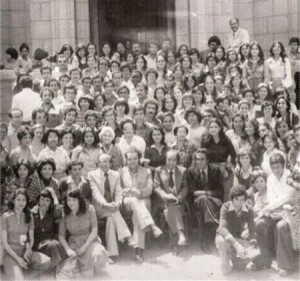 And pay special attention to the women graduates in these photos. Veil-creep, and all that the wearing of the veil represents, provides a graphic glimpse of the fading light of women in the land of the Pharaohs. 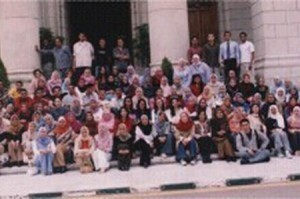 One wonders if in the near future there will be any women in the graduation classes of Cairo University. 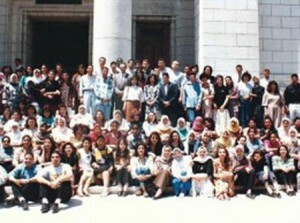 This entry was posted in Political/Social and tagged Egyptian women, veil-creep, wearing the veil. Bookmark the permalink. Wow! Great retrospective here! This is a wonderfully put together post using the simplest of ideas to make your point… 4 photos and anyone can understand the realities of Egypt and the sad future for the women there. Great post! Thanks, from one ex-Lefty who has seen the light to another. I agree, having lived on the Left for so long, I now feel I’ve gotten the full scope of political/social perspectives and can confidently think for myself. And what you said about growing up reminds me of the TS Eliot line: We shall not cease from exploration. And the end of all our exploring will be to arrive where we started and know the place for the first time.